I was looking forward to going back to Boracay, and staying at Taj Guesthouse, where we stayed last December. However, since Taj only had four rooms, it filled out pretty quickly. So I was left with having to find another place to stay in Boracay. I headed over to the place where I can get good recommendations: the Girltalk forums. 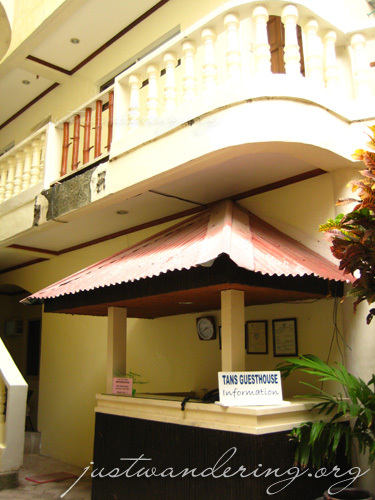 True enough, in the many pages of the Boracay thread, I was able to find a place that still have a room for the weekend: Tans Guesthouse. Tans Guesthouse was repeatedly recommended by Girltalkers who have stayed there before. It was easy to see why: the owner, Ms. Net is very quick to respond to e-mails and text messages. Not only that, she’s also very concerned about her guest’s needs and well being. This is also a trait that she was able to impart on her staff, who were nothing but accommodating to my questions and requests. When I e-mailed Ms. Net, inquiring about room availability for the date of my trip and the room rate, I also mentioned that I found out about Tans at the forums. The forum member who has stayed at Tans before mentioned that Ms. Net gives discounts to forum members, and since I’ll be shouldering the cost of the room on my own, every peso off the cost is welcomed. 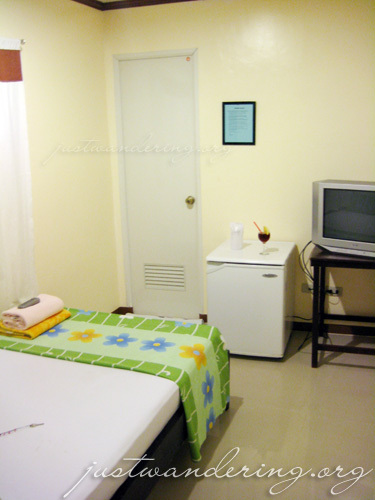 True enough, Ms. Net gave me the deluxe single room – a room that normally costs Php 1,500 during the lean season and Php 2,000 during peak season – for only Php 1,000. That’s a Php 1,000 saving already! Included in the rate are my daily breakfast at the roof deck cafe, welcome drink and one cocktail. I can also enjoy the free wi-fi at the 4th floor deck. Tans Guesthouse requires a 50% down payment to confirm your booking, a fact that didn’t register in my head until AFTER I deposited Php 3,000 into Ms. Net’s Metrobank account. Oh well, at least I didn’t have to worry about having enough money to pay for the room after my vacation. After paying, you’re supposed to fax the deposit slip to Ms. Net. Since our fax machine ran away from home last year (well, more like fax-napped), I texted Ms. Net asking if I can just scan the deposit slip and e-mail it to her. She replied, asking if I deposited the payment from the Taft Avenue branch or the EDSA Munoz branch. After I answered her question, she said there’s no more need to e-mail her the deposit slip. Five minutes after, she texts again, saying that the confirmation e-mail has been sent to my address. Come Saturday, I got on the 8:30 am Seair flight from Manila to Caticlan. As soon as I turned on my phone when I got inside the Caticlan terminal, I receive a text message from Ms. Net, asking what time my flight is. I replied that I have just landed, but is thinking of heading to Kalibo for the Ati-atihan. Less than 2 minutes after, my phone rings. It was Ms. Net calling, encouraging me to witness the Mother of all festivals, and that going there from Caticlan is very easy. She also told me to text her when I’m on the boat to Boracay, because she might be able to pick me up at the Cagban port. Wow, I never had this much conversation with a hostel or guesthouse owner before. Following Ms. Net’s order, I text her after boarding the fast craft to Boracay. She said they were still at the other end of the island, and won’t be able to pick me up at the port. It was no worry, as getting from Cagban to D’mall is very easy with the number of tricycles waiting to take passengers. She goes on to text me, asking whether I know how to get to Tans, whether I’m lugging a heavy suitcase, because she can ask somebody to meet me at the entrance to D’mall. I’m not used to this much attention, but I have to admit that it was great to have someone as doting as Ms. Net running the guesthouse. I arrive at Tans, which is just down the same alley as Taj. There wasn’t anybody in the reception, and I text Ms. Net that I was already there. She responds quickly, saying that Pen, is on her way down to meet me. Pen welcomes me, and leads me to the third floor. There I finally met Ms. Net, who has just arrived from the island day tour with some of the other guests. She shows me room number 9, which was my home for the next three days. The room was pretty straightforward: there’s a double bed, a closet and a clothes rack on one side, a TV and a ref in one end of the room. 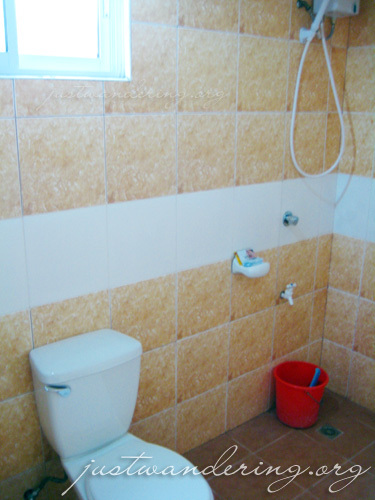 The toilet and bath is very roomy, not to mention very clean. Towels were provided — three actually. Pen joins us as I finish looking through the room, toting a glass of iced tea for me — my welcome drink. Ms. Net then hands me a necklace with pink and white shells, with a key to the room as a pendant. Cute! I settled down on the bed and quickly surfed through the channels until I come across Discovery Travel and Living. As Antony Bourdain was learning about the culture of Saudi Arabia, I took out my laptop to test if my hunch was correct: the 4th floor was a wi-fi zone and since I was on the third, there was a chance that Kabuki, my laptop, would be able to get some signal. What do you know, I was right! 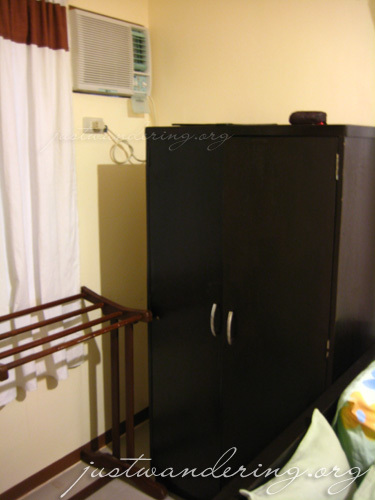 For Php 1,000, I get a clean room that can comfortably accommodate two, free breakfast, a welcome drink, a cocktail AND wi-fi in my room! The connection was spotty at times, and slow when somebody was using the laptop at the roof deck cafe, but at the very least, I can check my e-mail, Plurk and upload photos on flickr. I retired early that night, since I wasn’t able to sleep since Friday. I remember waking up at 5 in the morning, but since it was still dark out, I promptly went back to sleep. Much to my surprise, it was 10 am when I woke up — there goes the morning stroll at the beach! After checking my mail (and Plurk! ), I went down to go to the beach for brunch. One of Ms. Net’s staff was there (whose name I wasn’t able to get -_-;) at the reception, and told me that I missed breakfast. 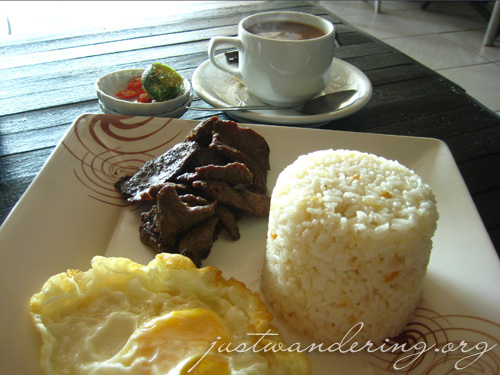 I was surprised that they even brought it up — most hotels, hostels or guesthouses wouldn’t care whether you avail of the complimentary breakfast. I explained that I overslept and promised to wake up early the following day. When I got back that afternoon, Pen asked me to fill in an order sheet for my breakfast the following day, and for the day after. She also asked me for my cocktail order, something that I totally forgot was part of the package. I told her I’d have the cocktail at 9pm at the roof deck cafe, but I got too engrossed with what I was watching that I forgot about it. Shortly before 9, Pen knocks at my door, reminding me about the cocktail. I asked her if I can have it in my room instead, and she gladly obliged. The following morning, I wake up bright and early for breakfast. I headed up the nicely done spiral staircase up to the 4th floor. The roof deck was mostly covered, but there’s an open air area in the balcony. There wasn’t any spectacular view, for the balcony doesn’t face the sea, but it gives a nice out of doors feel to the cafe. RELATED: Are you Boracay bound next year? Ms. Net’s staff are very friendly and helpful. They listen to their guests, and takes notes on their requests. When my cellphone’s battery ran out, I asked if they have a Nokia charger that I can borrow, since I never bring mine on weekend trips (because I hardly use my phone, but for some reason, people kept on texting that weekend). Pen uses a different charger, but went over to the other guesthouse to ask the staff if they have the charger I needed. Talk about going out of their way to fulfill a guest’s request. She also asked me if she can clean my room, because I didn’t ask for house keeping on my 2nd day. A lot of people at the forums were asking just how far Tans was from the beach. I didn’t have a meter stick with me, but I had a camera. This is a video of the walk from Tans to the beach so you can time how long it takes to walk from the guesthouse to the sand. Now I know why the girl at the forums kept on recommending Tans and gushing about Ms. Net. And now you know why I am recommending Tans and gushing about Ms. Net and her staff. wow, nice review about the owner, dyan yata kame dapat sa room 9, but mas nagandahan ako sa rooms ng Taj. I just hope kahit half man lang ng pagka attentive ng staff ng tans, ganun din sa Taj hehe. very nice review! pictures are awesome..ms net should use it for her website, with your permission of course..hehe..btw, i was the girl who endlessly gushed at GT and pex..tehee! armie: Aha! Ikaw pala yun! Thank you so much for your recommendation, my stay at Tans really was the best ever. Top notch service talaga! kaoko: Go go go! Really, if you decide to go, they’re a great place to consider. Sobrang windang ako sa value na nakuha ko sa Php1,000 per night! Sinta: Tans is waaaay out of Panoly’s league. It’s pretty basic, but if you don’t really need the amenities of the high end hotels (I mean, why swim in a pool when you have the gorgeous beach right there?? ), this is a great place. And, it’s near the beach! Aejie: True! Kahit alley siya, hindi nakakatakot pumasok kasi well lit naman ang area kapag gabi. Never kong in-expect I can get a room for this much na ganito kalapit sa beach at malapit pa sa D’mall. This seems like a great place to stay when one is in Boracay. Never been to Boracay, don’t have plans to go there any time soon, but the missus had been bugging me to take her there (for the longest time). Will probably give in soon haha. I’m glad I stumbled upon your blog. looking forward in staying there this may as the reviews on this hotel is great!!! hi! I totally agree with your review. A friend of mine recommended this place to me and I’ve been staying there ever since. Super maalaga nga si Net. Glad you had the same experience! Thank you so much for the review. I just called Miss Net and asked for a booking. This is very very helpful. Hi! your review is very helpful and informative. I just confirmed with Ms Net an accomodation. I hope my friends & I will have the same good experience. Thanks again! thanks a lot for the very helpful info. Your info on the cheap accomos in Bora was very helpful….I will be planning a surprise bash for my dad and I came across this blog….At first i was just palnning on a bonding trip with my father but knowing how VERY reasonably priced the places are, I can even bring the whole family for some good old PINOY style bonding in the pristine beaches of Bora! I really want to thank you so much..be there either last week of May or first week of June…What would be the best time sched between the 2? Very helpful review..Will go there on the 22-25th of this month, hope we have the same good experience. Thanks for the nice review, we’re planning to go back this January. We’ll be staying for 10 days. We really need a cheap hotel this time, coz last time we stayed in Boracay Tropics. It will cost us a lot if we stayed there again. Anyway, is it near D’mall? Thanks? Thank you so much. Very informative. Keep writing! Very informative, i couldn’t ask for anything more cause every inch of details was well said. 1. are they both very near the beach? 2. do they have both free breakfast for 4 pac (if 4 in a room)? Please read the entry again; answers to your question can be found if you read it and watch the video. Oh, they call the annex building Villa Simprosa. Your review of Tans sounds great but I wondered if the annex was much the same? Hi! We will be going to Boracay this coming June. My Girlfriend and I already booked with Tan’s Guesthouse and all I can say is that they respond very quickly regarding my inquiries. I think this is room #9 as I saw in their website. Is the room comfortable enough for two? Because there are 2 deluxe single rooms in Tan’s. The other is room #2 which i think has a bigger bed. Hi Drei, it’s comfortable for one, but it has just enough room for 2. It’s not as roomy as it would be if you’re alone, but there is enough space naman so you don’t bump into each other. annex building is new, nice to stay. ms. net gives discount for referrals. hi tans! 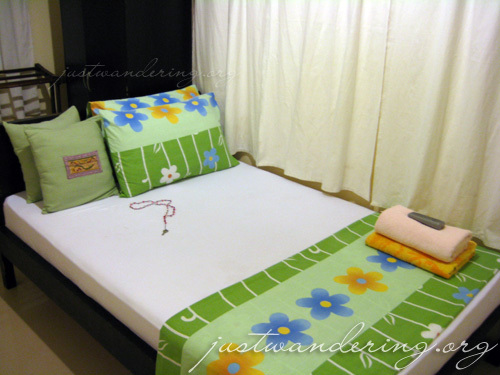 it’s been awhile since weve 1st vist boracay last march 19. it was a perfect experience for us..u have a nice rooms! were very glad that weve experienced your newest rooms..its like a hotel! its not just an ordinary rooms. and u gave it for a cheaper price!hehehe me and my friends wants to go back there soon and we still want to stay w u tans!same rooms!?!hahaha! food was nice.staffs are nice too. and we already recommend it w r friends! actually they stayed there last month..thank you tans! its awesome! its worth the wait!godbless and morepower! Hi nina, thank you so much for the infos..very informative.. God bless you.. Very helpful post. I haven’t visit any beach resort in Boracay and hoping to visit this year. I’ll add Tans Guesthouse to my list. Thanks again! I already sent an inquiry to them regarding our visit this April. Can’t wait to visit Boracay and stay with Tans Guesthouse with my family!! Hello po, mag papabook lang po sana ako para as may 2. Pwd pa po ba? I stayed there before, and the experience was great! Amnesties are also good. I love Boracay, an it always keep me coming back.